Merhaba all; we had a delightful Turkish cookery class at the weekend and this baked eggplant or aubergine kebab with chicken, onions and peppers was a big hit at the class. This is a southern Turkish style kebab, prepared at homes. The aubergines (eggplants) are double baked in this recipe, Southern Turkish style, which intensify their flavor. In Southern part of Turkey, especially in the regions of Gaziantep and Antakya, locals would use up the left over grilled or barbecued eggplants to make this delicious, home style kebab the next day. A tradition in Antakya is to prepare the kebab at home and take the tray to the local bakery to be baked in the wood fired oven, providing amazing, melt-in-the mouth flavors. I hope you enjoy recreating this lovely, impressive dish in your home for family and friends. Tip: Marinating the chicken in yoghurt, olive oil, Turkish hot pepper paste, biber salcasi and spices is really well worth the effort; it tenderizes the chicken and enables the flavors to blend well. This is a southern Turkish style kebab, prepared at homes. 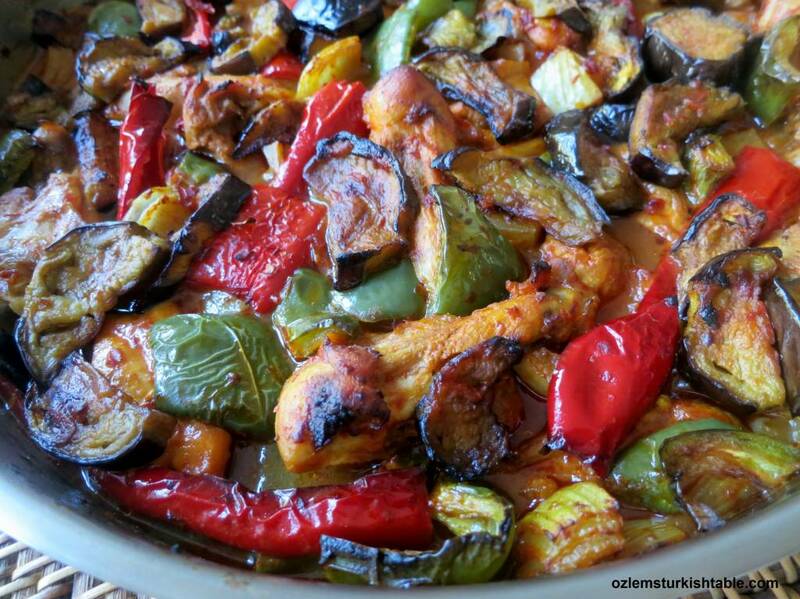 The aubergines (eggplants) are double baked in this recipe, Southern Turkish style, which intensify their flavor. Marinating the chicken in yoghurt, olive oil, tomato paste and red pepper paste is well worth the effort, as it tenderizes the chicken and enables the flavors to blend well. 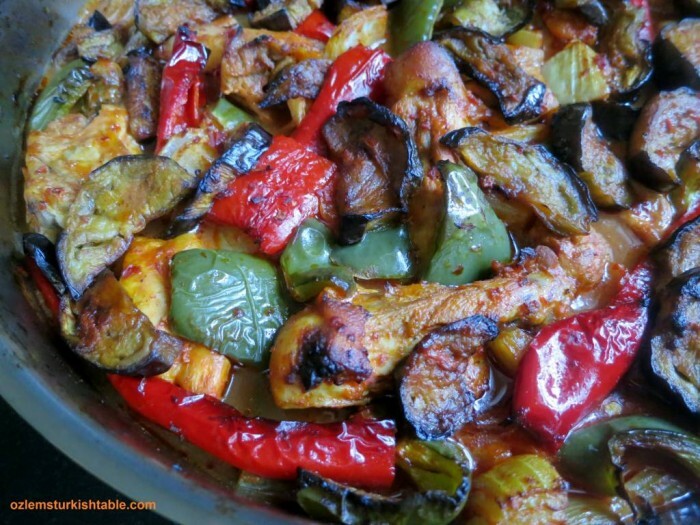 I hope you enjoy this delightful, home style baked aubergine kebab with chicken and vegetables. Peel the aubergines (eggplants) in zebra stripes, using a vegetable peeler or a small knife. Cut the aubergines in lengthways then in 1cm (0.4”) thick slices. Place the slices on a tray and sprinkle salt over them (The salt will help extract the bitter juices out of the aubergines). Set aside for 15 minutes. Prepare the marinade for the chicken. Place the chicken pieces in a large bowl. Stir in the yoghurt, garlic, olive oil, tomato paste, red pepper paste (if using) and red pepper flakes. Season with salt and ground black pepper to your taste and combine and mix the chicken pieces with the marinade. Cover the marinade and leave in the fridge for 30 minutes (you can prepare this marinade ahead of time, even overnight and leave in the fridge). Using kitchen paper towel, squeeze the excess moisture out of the aubergines. Place the aubergines on a tray and drizzle 3 tbsp. olive oil over them. Coat the pieces with the olive oil and partially bake in the preheated oven for 15 minutes. Heat the olive oil in a large heavy pan and stir in the marinated chicken pieces. Sauté over medium to high heat for 4 – 5 minutes, turn the heat off. Once the aubergine slices partially baked, prepare the chicken & aubergine bake with vegetables. In a large baking dish, place a chicken piece next to onion, pepper (alternating red and green pepper pieces) and aubergine slices. Keep on placing chicken and vegetables in this order side by side, until all the chicken and vegetables are layered. Spread any remaining aubergine slices at the top. To prepare the sauce, stir in the red pepper paste, tomato paste, red pepper flakes and the water to the pan used for sautéing the chicken. Combine all, also using any leftover chicken marinade sauce in the pan. Pour in this mixture over your tray with the chicken, aubergine and vegetables. Bake in the oven for 35 – 40 minutes, until chicken and vegetables are cooked and turned light golden color. Serve hot with plain rice or bulgur pilaf aside. Marinating the chicken in yoghurt, olive oil, Turkish hot pepper paste, biber salcasi and spices is really well worth the effort; it tenderizes the chicken and enables the flavors to blend well. 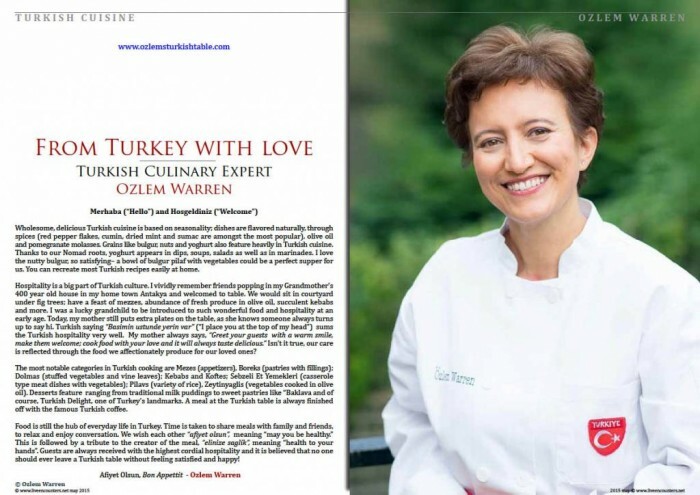 I have been delighted to be featured at the wonderful Live Encounters Magazine with my recipes and stories from my homeland, here’s the link to the full article, I hope you enjoy this wonderful magazine. Live Encounters is also running a little contest in my article, where 4 lucky winners may have a chance watch my online Turkish cookery course free. All answers are in the article! : ) Hope you enjoy reading this wonderful magazine. 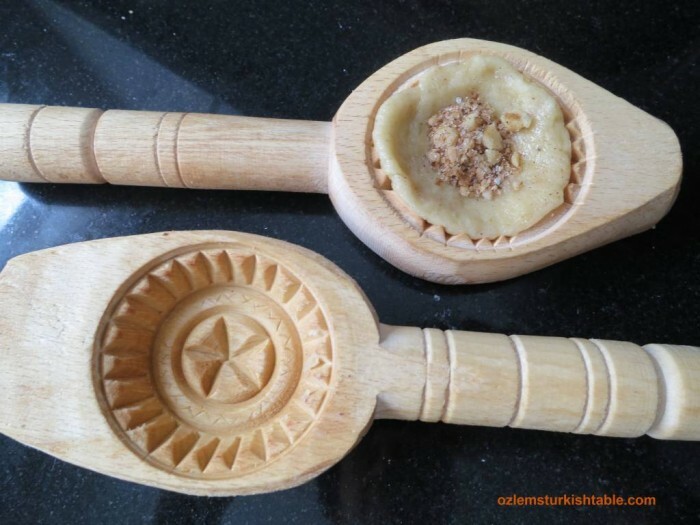 Another special treasure my parents kindly brought back from Antakya was these very pretty wooden molds which the locals use to shape the delicious Kombe cookies. 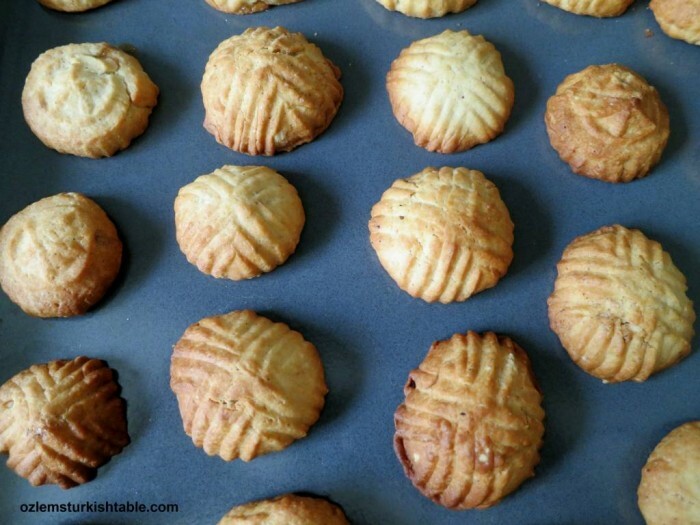 I adore the molds’ intricate, delicate designs and have always been always fascinated with the special place these cookies have throughout the Middle Eastern cuisines. Wooden kombe cookie molds have intricate, delicate designs, just beautiful. Kombe cookies are made in every special occasion in Antakya and surroundings; weddings, religious festivals, Ramadan or at any special gathering. They have a delicious, crunchy bite to it and I like that they are not overly sweet. 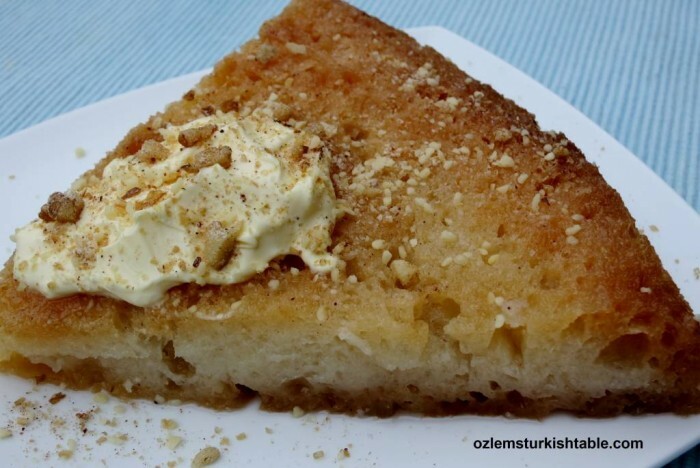 There are variations of kombe cookies even in Southeast Turkey; some has only nuts in it, some would have dates, as in the case of their Middle Eastern cousin, Mamul or Ma’amoul. 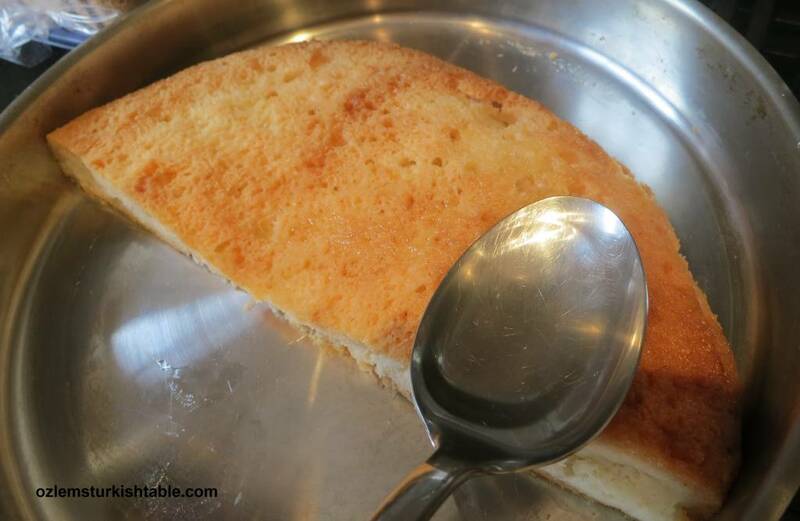 Regardless of their variation, both kombe and ma’amoul have a special place throughout the Middle Eastern cuisines and have been a part of the celebrations in different religions; during Ramadan, Easter and Hanukkah. Indeed a special cross cultural cookie and I think that makes it even more special. My 7 year old daughter is a keen baker and she was fascinated with the beautiful kombe molds that anneanne, grandma brought. So we all gathered in the kitchen a few weeks ago; anneanne, myself and my daughter, shaping the kombe cookies. She was fascinated with the shapes forming in the wooden mold and hearing anneanne’s stories. 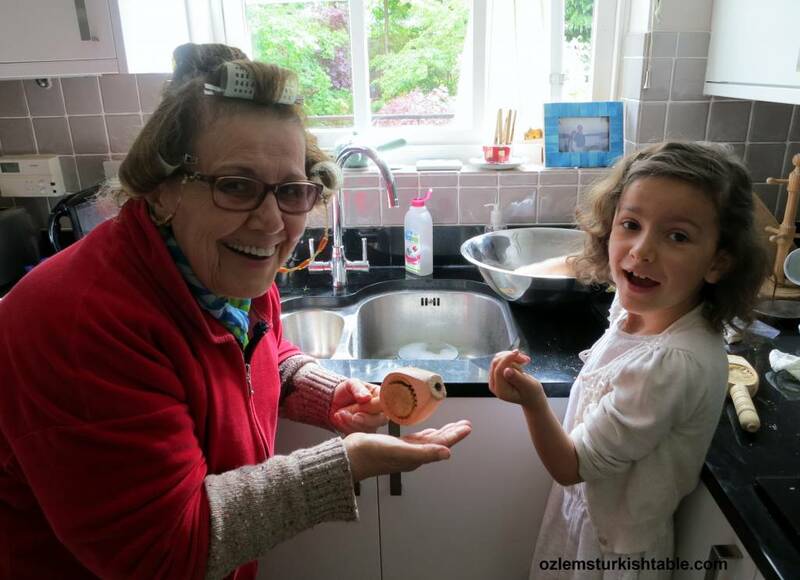 Then mother wanted to consult my dear cousin, Rana in Reyhanli – Hatay, the “pro” Kombe maker in the family, to fine tune the recipe. Rana very kindly went over the kombe recipe as the way it is made in our family; our very special thanks goes to Rana for her invaluable contribution. It was a very memorable experience, which I hope will stay with my daughter a lifetime – a very special recipe and tradition to pass on the next generation. Baked kombe cookies; love its crunchy texture and delicate taste, flavored with cinnamon. We used crushed walnuts, sugar and cinnamon in the kombe filling; cinnamon pairs beautifully with walnuts. In Antakya, a special blend of kombe baharat is also sold, consisting of mainly ground cinnamon – there’s also ground all spice, mastic, mahlepi, ground ginger and ground clove (some locals may add a few other spices) in the fragrant kombe baharat (If you’d like to make your own kombe baharat, the ratio of cinnamon to the others in the blend is roughy 3:1). I love that these delicate, crunchy cookies are not overly sweet and they are wonderful with tea, cay or Turkish coffee. I hope you enjoy these delicious Kombe cookies. The wooden molds are a treat; make sure you get some if you plan to go to Antakya, Uzun Carsi (Long Market). If not, you can still decorate your cookies with a fork. 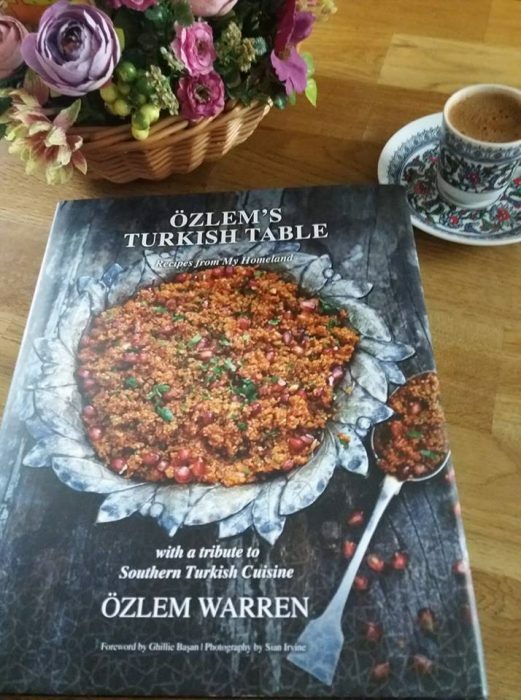 My cookery book, Ozlem’s Turkish Table, Recipes from My Homeland, is a special tribute to my roots, going back to Antakya. I hoped to showcase delicious, authentic regional recipes, especially from southern Turkey and Antakya, including these lovely kombe cookies. More than a cookery book, it has personal stories from my homeland, along with beautiful photography; Signed copies are available to order at this link, if you’d like to copy. 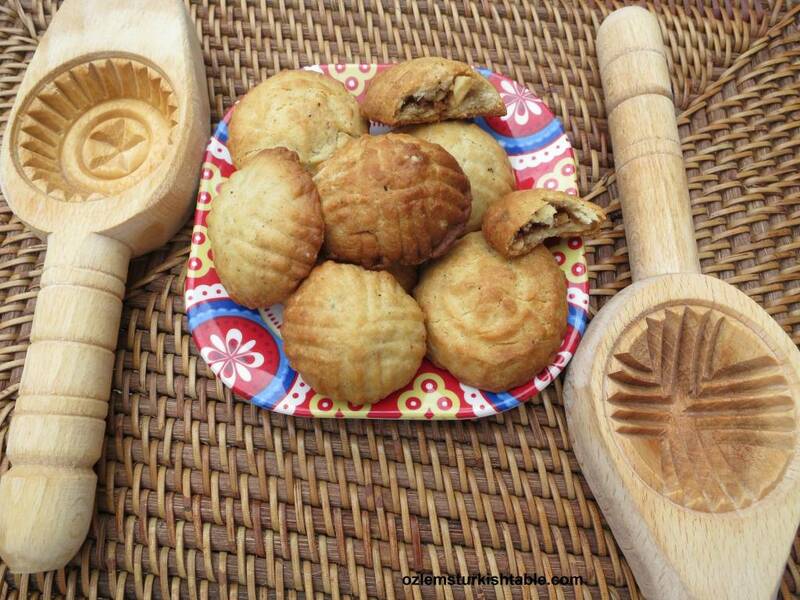 I hope you enjoy Antakya's delicious kombe cookies, shaped in the beautiful, intricate wooden kombe molds. 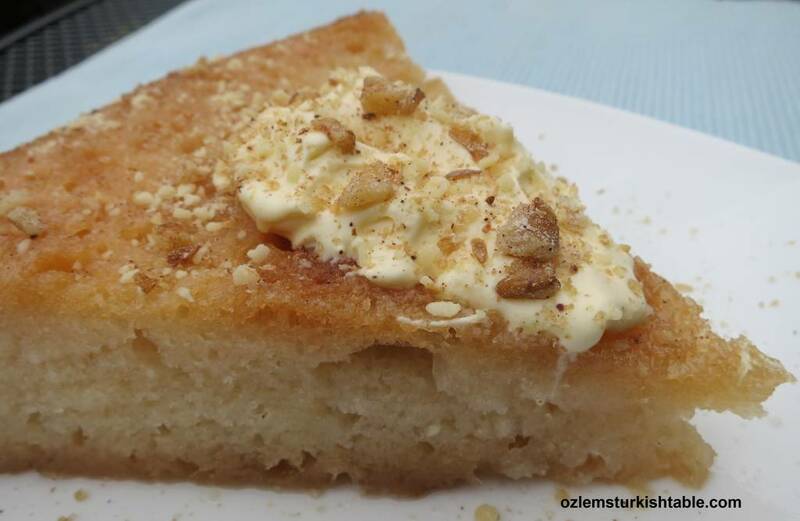 Kombe cookies are made during every special event in southern Turkey, Antakya and surroundings; weddings, religious festivals, Ramadan or at any special gathering. They have a delicious, crunchy bite to them and I like that they are not overly sweet. As well as walnuts and cinnamon, dates can also be used in the filling, as in the case of their Middle Eastern cousin, Ma'amoul. Combine the flour and the melted butter in a large bowl and mix well. 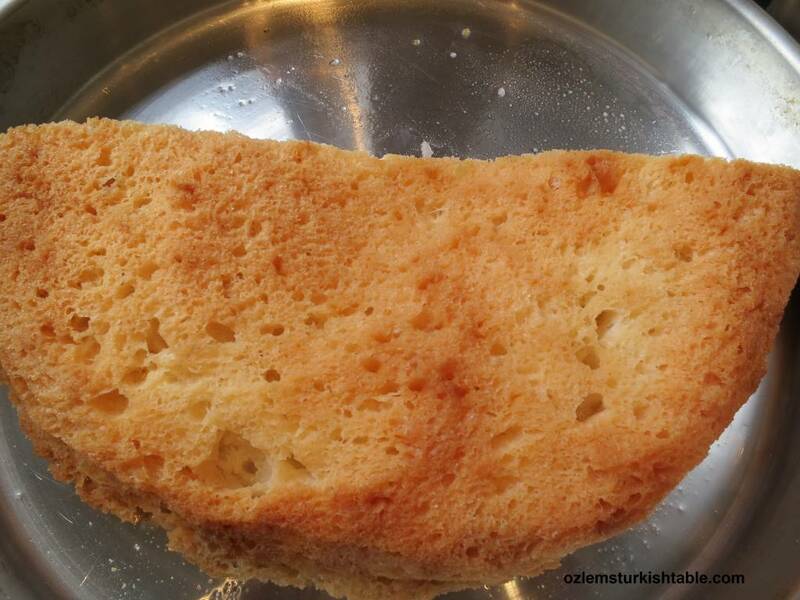 Dissolve the sugar in the warm milk and add to the flour mixture. Pour in the vanilla extract, egg whites and the cinnamon or kombe baharat, combine well. Knead the mixture well for 2-3 minutes, until the dough is soft and smooth. Take a small walnut size of the dough and press the dough gently into the mold to take its shape. Stuff this dough with about 1 ½ tsp. of the filling mixture. Take another small piece of dough, about half of the size of the first one. Flatten and press this dough gently over the filling,to form a cap and close the dough. Press gently and seal the ends of the dough. 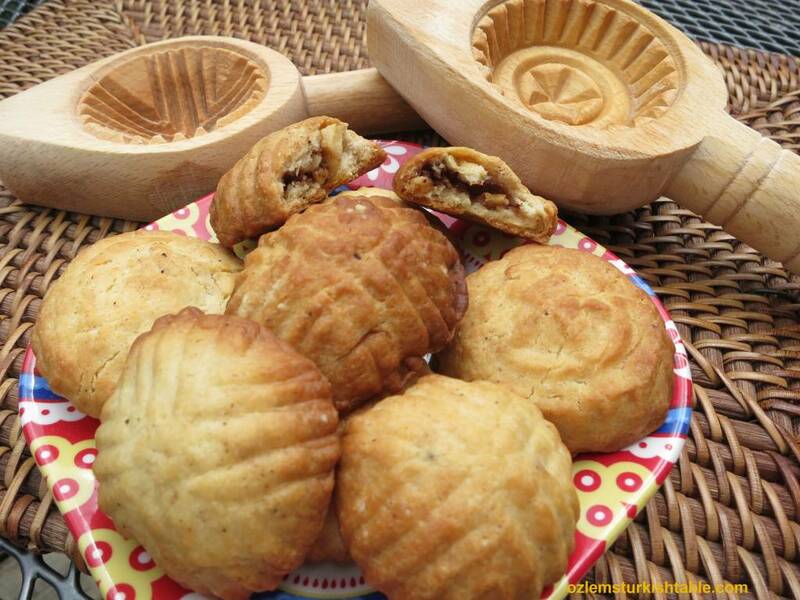 Remove the kombe cookie from the wooden mold by tapping the end of the mold with your fingers firmly and make sure to catch the falling cookie, shaped with the mold’s intricate design. Place the cookie on a baking tray and repeat this with the rest of the dough. Bake the cookies for about 20 or 25 minutes, until they get a nice light brown color. They are traditionally lighter in color. Once cool, serve the Kombe cookies with tea, cay or coffee. Kombe cookies can be stored in an airtight container for at least 3-4 days. I have been delighted and honored to see my blog Ozlem’s Turkish Table being featured amongst the best Turkish food blogs by the Daily Sabah national newspaper in Turkey. Please check out the link for the article and also meet other wonderful Turkish food bloggers. With this opportunity, my heartfelt thanks goes to you all for all your support; it means so much to me.